~Let’s be honest we all like to be looked after. When someone takes a personal interest in us it can do wonders for our confidence and self-esteem. On an academic level, courses are being run to enable students to have the essential skills that can help both them and the group of people they are working with. The Lancashire School of Business and Enterprise at UCLAN are proud to now offer the ILM Level 5 Certificate in Effective Coaching and Mentoring. The free taster session takes place this Thursday April 4th between the hours of 4pm- 6pm. The place of learning will be based at UCLAN’S Greenbank Building Room 170, Preston Campus. Attendees will gain a greater insight into Coaching and Mentoring, the ILM course that will be delivered and how developing these skills can benefit your career or organisation. • Provide a general overview of the Coaching and Mentoring process. • Explain how creating a proactive Coaching and Mentoring culture can contribute to supporting effective organisational, team and individual success. Help recognise the benefits of Coaching and Mentoring as a learning and development tool. develop and accredit their Coaching and Mentoring skills. It will provide them with an overview of studying the subject area at a higher level, this includes the Institute of Leadership and Management (ILM) part-time CPD course, with the opportunity to find out what the course entails and speak to the tutors. 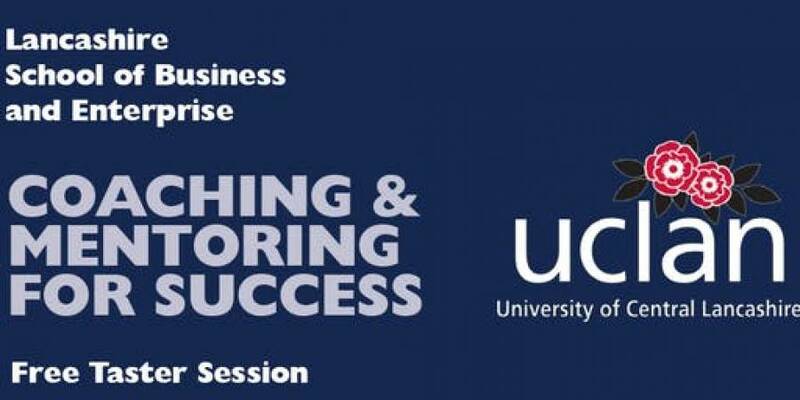 Please note :-the taster event is aimed at Managers, HR/Learning and Development professionals, business owners or individuals with an interest in Coaching and Mentoring people. Only attend if you fit the above criteria.